Red and yellow make...10 a.m.! Screwdriver, anyone? And red and blue make...5 o'clock. Who wants a happy hour Purple Hooter? Yellow and blue? It's midnight! Bring on the absinthe. The Color Wheel Watch mixes things up for the artists and designers out there. Well, the artists and designers who actually care about time, and don't consider it an evil construct created to chain their creativity to a deadline. 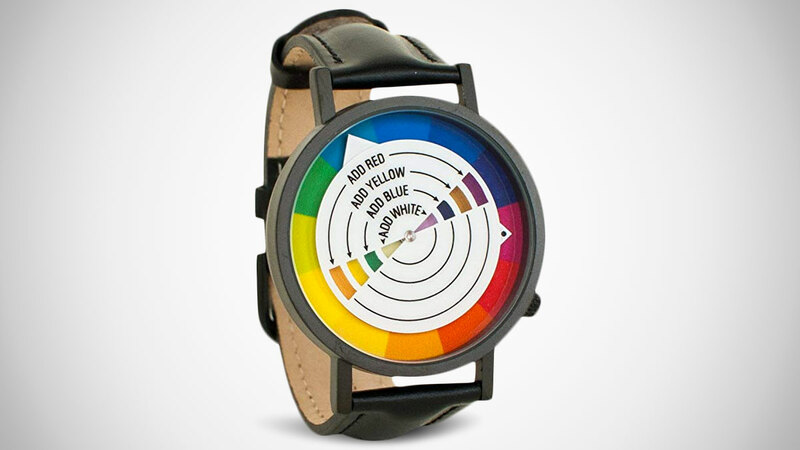 The analog Color Wheel Watch incorporates Roy G Biv in its readout of the hours and minutes of your day. It also adds a clever adaptation of the color wheel to give wearers a functional color-mixing reference. Whether they need it or not, I'd say the watch's effect for anyone into art or design is 7/10 charming.